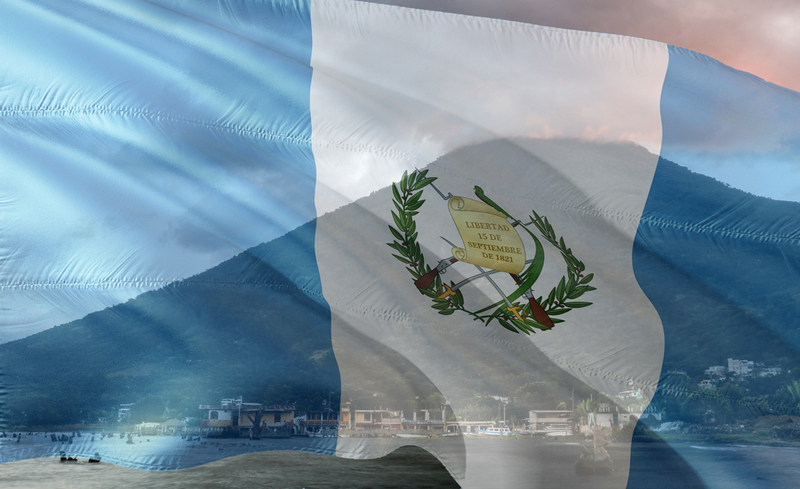 Often, those who visit Guatemala are pressed for time and often struggle with deciding where to visit and for how long. We were definitely part of this group, especially when trying to decide which town of Lake Atitlan to base ourselves in. Seeing as our visit coincided with the Christmas holidays, we booked our accommodation several weeks in advance – in fear that we may not find anything. 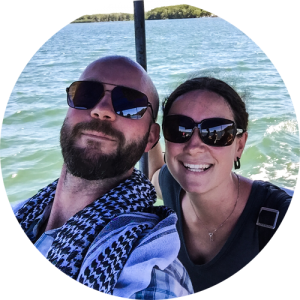 We decided to split the majority of our time basing ourselves out of San Pedro and Panajachel roughly half and half, though if we were to do it again, we’d do thing differently. To help any of you who may be planning a visit to this fantastically beautiful place, we’ve put together a little guide to help you decide what would suit you the best. Keep in mind, all of the villages are easily accessible by boat, but having a comfortable home base is always important. 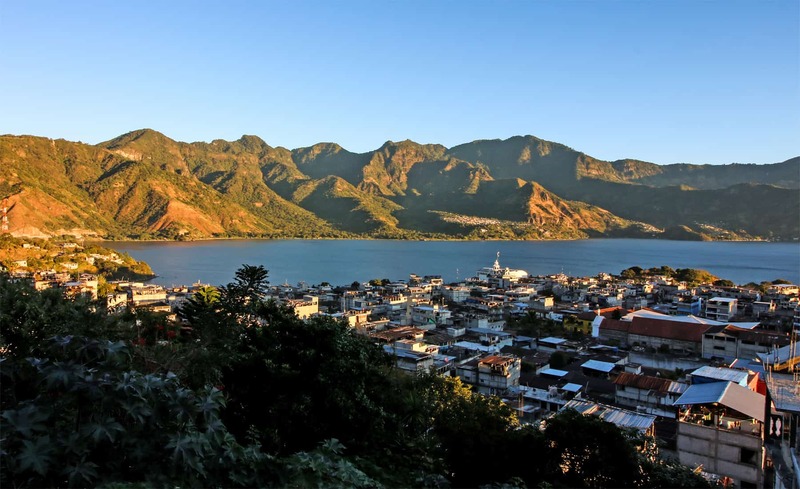 Pana, as most people call it, is the main access point and central town of Lake Atitlan and the jumping off point for the rest of the villages. While visiting, you’ll certainly pass through. It’s the largest of all the towns and where the majority of tourists and expats make their base. Along the main strip of Calle Santander, you’ll find a lot of western-style restaurants as well as a happening nightlife scene. Beginning late in the afternoon, street food carts make their appearance; offering a wider range of food options away from the burgers and pasta. It’s also home to the largest supermarket on the lake, a Dispensa Familiar, which is owned by Wal-Mart. 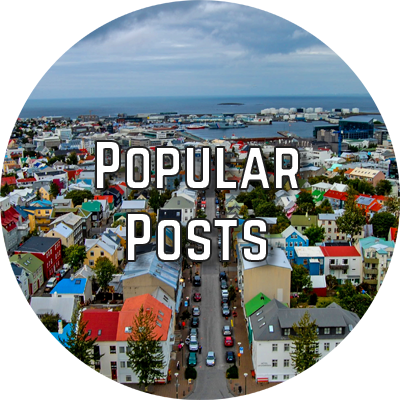 It’s a great overall one-stop-shop, but we prefer to shop as often as we can at smaller shops and local markets. One such market is located daily near the bus stops near the main church. 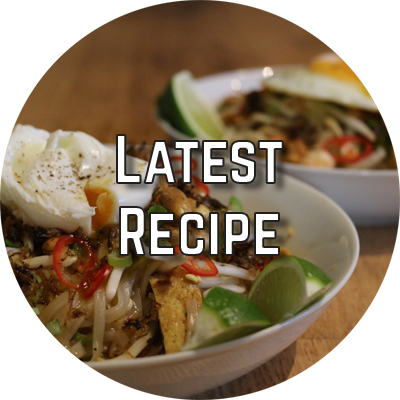 Two other great options for groceries are Sandy’s and Chalos, both offering plenty of imported food as well as local provisions. Pana is the place to stay if you’re short on time, looking to meet up with other travellers, or make day trips to the villages. It also has the most shopping options, many stalls selling an assortment of local handicrafts. Accommodation options run the whole spectrum, from high-end resorts to backpacker hovels. We spent an entire week here and it was far too long for us personally. The second most popular town in Lake Atitlan, although much more laid back – it’s where the majority of budget backpackers come. There are plenty of great restaurants with a wide variety of food options, amazing accommodation choices and some of the cheapest Spanish language schools in the country. For longer-term visitors, self-catering options are fantastic! In the upper end of town, you’ll find the main local market, offering fresh produce and meat for very decent prices. Just passed the market is a small grocery store called Andy’s, which has a decent selection for great prices – including the cheapest beer in town. Another option, near the main dock and general tourist area, is Salud Para Vida. It’s a nice little organic shop that sells everything from gluten-free flours to meat alternatives and imported goods. Some street food comes out at night, up near the market and Andy’s. It’s the cheapest food you will find in San Pedro and typically consists of grilled meats, with some potatoes and beans. Simple, but delicious. This is definitely our favourite village on the lake. Just two kilometres up the road from San Pedro, the vibe in San Juan la Laguna is similar but much quieter. 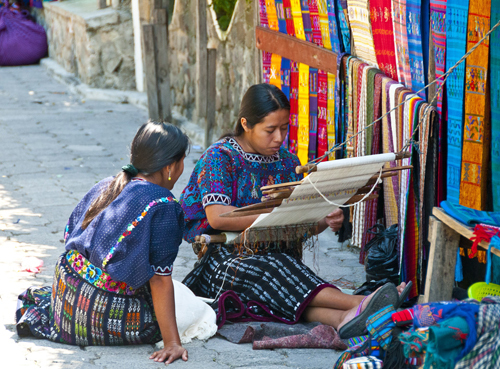 It’s also the best place on Lake Atitlan to buy locally-made cloth and handicrafts. Local women here weave some of the finest quality textiles in the country. All the proceeds go directly back not only into the community but directly to the individual who crafted the item. San Juan is a bit more of a sleepier town, regarding activities and nightlife, when compared to its neighbour. This results in prices being a little cheaper overall, but the number of bars and restaurants is significantly lower. If you’re looking for the convenience of San Pedro with more of a local vibe, this is definitely the choice for you. 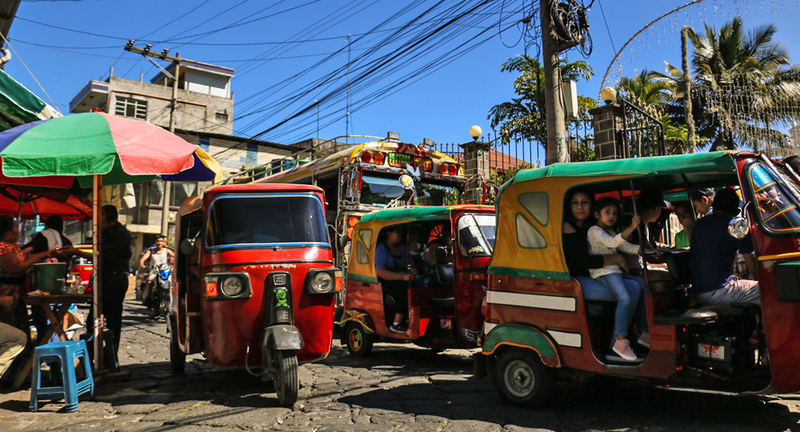 It’s only a short tuk-tuk ride to San Pedro if you need to shop for anything over and above what’s in the market. There is plenty to do if you are interested in handicrafts, learn how to spin yarn out of cotton and dye it naturally. You can even tour a local organic coffee plantation and visit an artisanal chocolate factory. It’s definitely worth checking this place out if you get the chance. When you’re there, be sure to eat at Alma de Colores for great food (including homemade bread), wonderful atmosphere and a chance to give back to the community. It is a social inclusion program for locals with disabilities. Prepare to have your chakras aligned; the new-age hippy vibe runs deep through this village. It certainly doesn’t offer the same style of activities as some of the larger towns on the Lake, but if meditation and yoga is your thing, San Marcos is the place to be. Be sure to look into the courses and retreats happening here before arriving, as some retreats require pre-registration. Aside from meditation and yoga, there are plenty of other smaller courses you can partake in. Everything from astrology and dream interpretation, to crystal healing and reiki. For those of the spiritual mind, San Marcos is definitely a place to expand yourself. If the above-mentioned activities aren’t quite your thing, don’t let that steer you away. San Marcos is said to be the prettiest village on the lake and at the time claimed to be the only place that was clean enough to swim in. Even if you aren’t planning to stay for long, it’s worth a visit to take in the atmosphere of San Marcos. 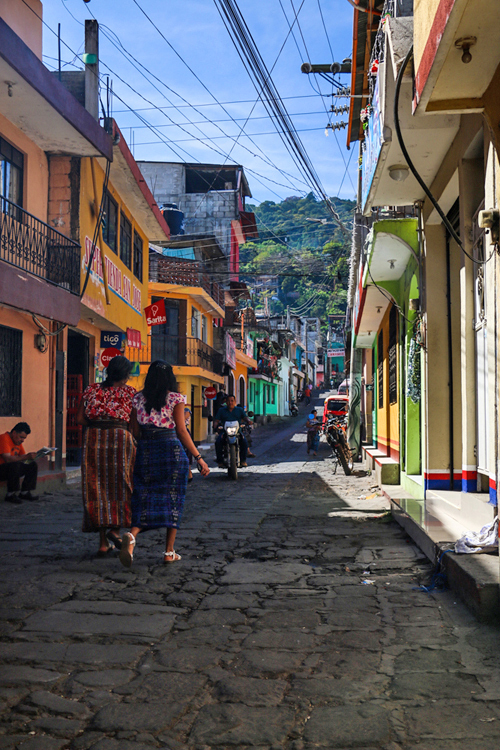 The least developed of the main villages, Santa Cruz is a traditional Mayan town built on a steep hill. It’s location and layout make it the best spot around the lake for taking those iconic sunset photos. While physically the closest town to Panajachel, it’s one of the most isolated due to its boat-only access. Although that is, of course, part of the charm. People tend to either visit this village for a short day trip or stay for several weeks at a time. One thing to note is that there is little to no shopping here. and no ATM’s; but seeing as Pana is only a ten-minute boat ride, you’ll have no issue. Santa Cruz is also home to the only dive shop around the lake, so if Scuba is your thing, definitely check it out! As mentioned above, the main kick-off point to the rest of the lake is Panajachel. The ferries to all of the main villages leave from the docks here and range from Q10 to Q30, depending on distance. The boats follow no strict schedule and simply leave when full; however they do stop running after 7 pm. 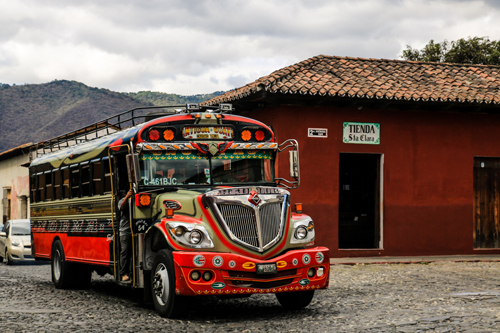 There are many shuttle companies that run between San Cristobal and Lake Atitlan; you can even book one all the way to San Pedro. Prices vary, but we paid 400 pesos. You’ll be driven to the Mexico border where you cross on foot and catch another shuttle which will take you through to Panajachel. There is a 500 peso exit fee to leave Mexico if you’ve been in the country for more than seven days. If you entered the country by air, the fee was likely included in the ticket price. Be sure to have a physical, printed copy of your flight receipt to avoid having to re-pay the fee. We’ve heard there is some fine print that you may be able to use to avoid payment at all, but aren’t sure of the details. If your Spanish is good enough, you may be able to figure it out! 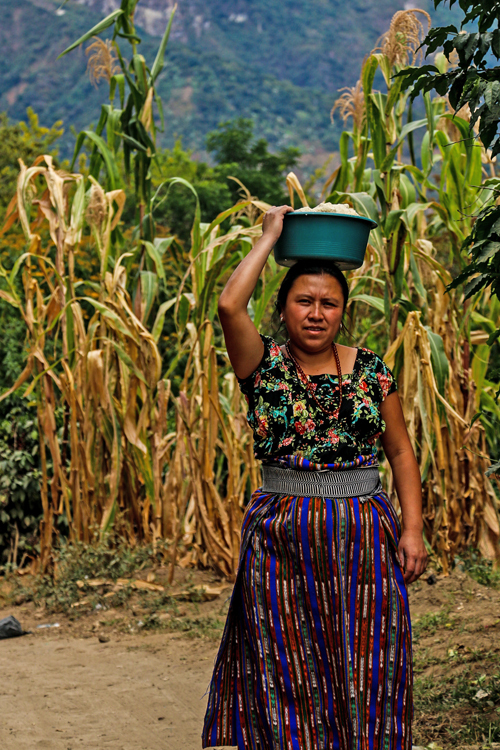 Also, the border agents on the Guatemalan side often ask for a small fee – in Mexican pesos. This is not an official fee, don’t pay it. First, the trip can take much longer than expected and often arrive in Panajachel after the ferries stop running. It may be best to book your first night there to avoid issues. Also, the price to San Pedro includes the ferry fee. Occasionally, shuttle drivers will pocket this fee and leave you at the docks, where you’ll have to pay the fee again. Be sure the driver pays the ferry driver before driving away. You can hire a shuttle company that will pick you up from your hostel and bring you to Panajachel for about $12 per person. A considerably cheaper – and equally more exciting option – is the chicken bus. You may be told that there aren’t any direct busses, and that you’ll need to make some transfers, but at the time of writing, there is definitely a direct bus to Panajchel. From our understanding it’s just once per day, so ask around at the bus station the day before. 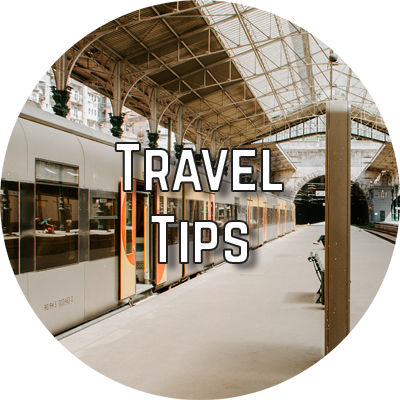 This route is notorious for pickpockets, so keep an eye on your belongings. The chicken bus is also a wild ride – very fast on really winding roads. If you’re prone to motion sickness, take necessary precautions. Shuttles are always the easiest and quickest route, but chicken busses are always an option. Again, there are several ways to go that involve transfers but there is also a daily direct bus that leaves at 10:45 am. Pick it up on Calle Principal by Hotel Primavera, it will be around 35Q. 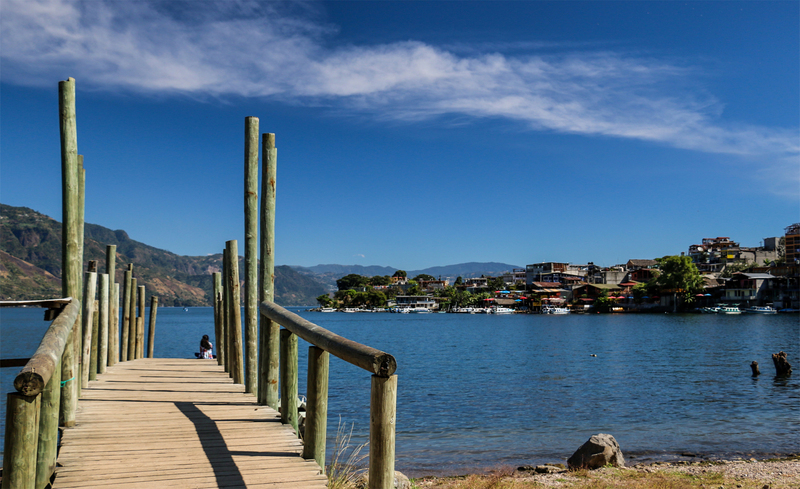 With so much variety, it’s easy to see why Lake Atitlán is a favourite destination for travellers of Guatemala. It’s also no surprise that many people show up and end up never wanting to leave. I highly recommend it! It’s one of our favourite spots in all of Central America! I love to visit the village sides. It gives you lot more for a soul. Loved your pictures. Especially of the woman and sunset at the lake. I love that lake 🙂 Second post and it looks like such a different world. Well, the most important thing about me is photography. How do people react? Is it safe to hang out here with a camera? I liked the “chicken bus” most fall, crafted vehicles are so cool. Yeah, the chicken buses are great! We didn’t have any issues with the camera being out, although we never had it with us in the evenings.